There’s a guy called Jeff and he lives at home. That much is clear. Jeff (Jason Segel) is in his late-twenties and spends his time watching Signs (the 2002 M. Night Shyamalan film) and smoking dope. He is convinced that he is on the earth for some greater purpose, much to the despair of his mother (Susan Sarandon) and his brother, Pat (Ed Helms). It’s fairly ridiculous, really. However, the last ten minutes or so blew me away – I guess I’d been lulled into such a state of boredom that when something actually happened, I got a bit too excited. For most of the film, I couldn’t really see the point of the Susan Sarandon sub-plot. In fact, even looking back, it’s not really necessary. Plus, Ed Helms really annoyed me. He’s fantastic in The Office; an over-the-top character blends in there. This film seemed to generally be pretty realistic, and his portrayal of Pat for much of the film didn’t blend well. It was only in the final sequence that I really believed that Pat could have been a real character, and not simply comic relief. 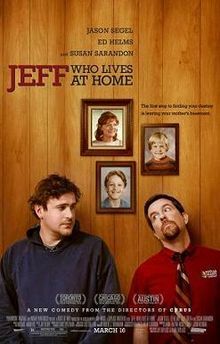 Jeff, Who Lives at Home is a great title, but not a great film. Worth watching, but not really worth going out of your way for.